Nira was a princess. She was kind and warm-hearted. Nira was well liked for her humble nature regardless of her royalty. But Nira was not a beautiful princess like most princesses are. She wanted to find beauty to become the princess everyone expected her to be. Nira wanted to shine amongst all at the ball. If only she could find a way to discover true beauty by the time of the ball. Nira’s journey leads her on a search and revelation about beauty and inner beauty that will change her life forever. You can also pay by check. The book is offered by Nancy at the best price: $6.00 plus $1.70 for shipping & handling. If you wish to purchase multiple copies of Nancy's books, a special discount is available. Please email Nancy at npchfabian131@gmail.com for details. 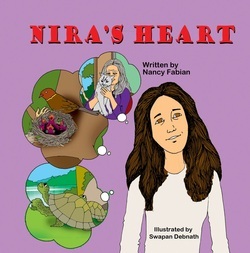 NIRA'S HEART is also available at these online retailers: Amazon and Barnes & Noble.